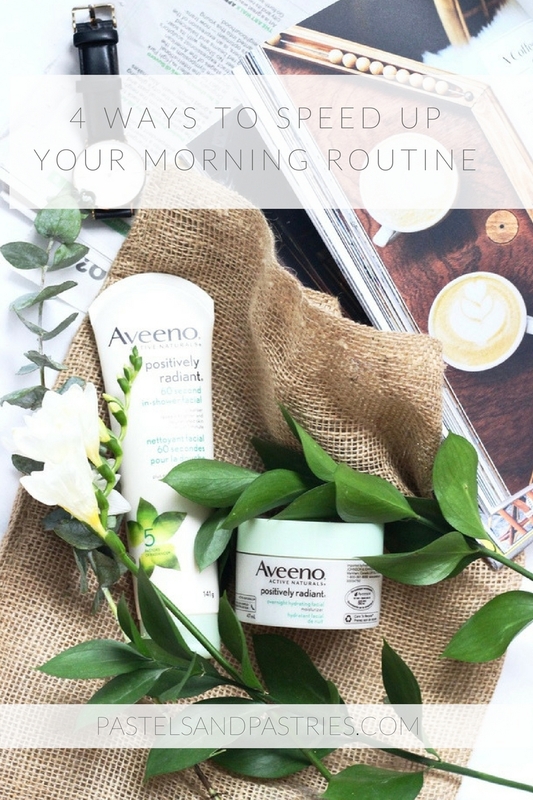 Thanks to AVEENO for teaming up with me on this post! We've all been there... waking up to the sound of the alarm clock in a fuzzy state, too tired to focus. Or, maybe you pressed snooze a few times too many and now are rushing to get out the door. Whatever the case may be there are certain ways you can ensure you get it all done in the morning, and even save a bit of time to have a moment for yourself. If you're thinking how on earth can I have a moment for myself in my most rushed mornings I am here to tell you it is possible, people! And thanks to Aveeno I am going to fill you in. All you need to do is spend a little bit of extra time planning and I promise you can reward yourself with a few extra moments to spare! Who doesn't want a pre-work facial? Double hands up! Am I right? If you think you don't have the time you're wrong. 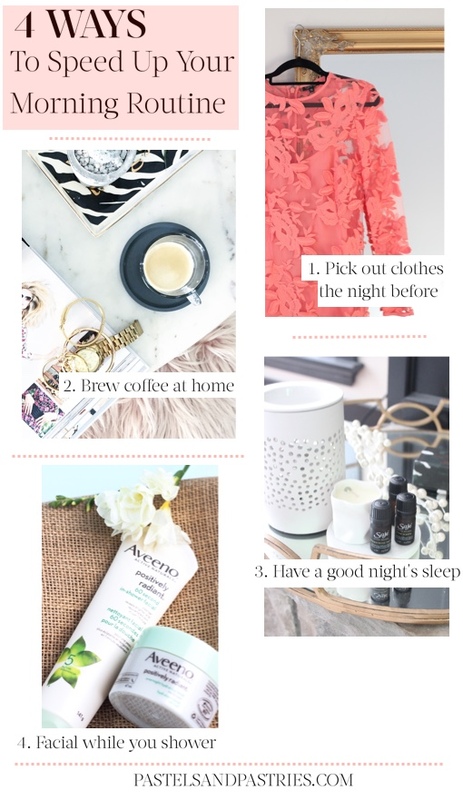 Here are 4 ways you can speed up your morning routine and carve out a little bit of "me time" even on the most hectic of days. Pick out your clothes the night before. Sometimes you pull an outfit together in your head, it totally works and you’re thinking to yourself that was completely magical. Other times you go to actually put on the outfit you’ve concocted in your head and it’s a total mess. Just doesn’t work. This happens to all of us but if you plan and try on the outfit beforehand you know it will work and it will save you the dreaded “I have nothing to wear/nothing fits/I need a whole new wardrobe” debacle. Brew a coffee at home. This can be a huge time saver! Skip the AM Starbucks run and make your own drip coffee at home. You never know how big the line-up will be or what other unforeseen circumstances may come about. In the summer months, I like to have a big batch of cold brew in the fridge for mornings on the go! So simple. Start your routine the night before to make sure you get the maximum number of sleeping hours. There are little things you can do to ensure you get the best sleep possible. Make a sleepy time tea an hour prior to bedtime, take a tablespoon of magnesium (I love this one by Calm, it relaxes the body and even your digestive tract will thank you! ), and diffuse an essential oil. Saje is my holy grail for essential oils. We always diffuse Unwind or Tranquillity before bed. Lately, I've been using the aromaGem, it purifies the air, acts as a humidifier, will help you rest, and its style is so on point. It just looks like a chic home decoration! Essential oils have such a healing effect on me, so to ensure I get a good night's sleep or to just put me in a positive frame of mind I have something diffusing. Facial while you shower. Now, for the moment you've been waiting for! I am here to answer your question regarding how the heck you can facial while you shower, and even while you sleep. 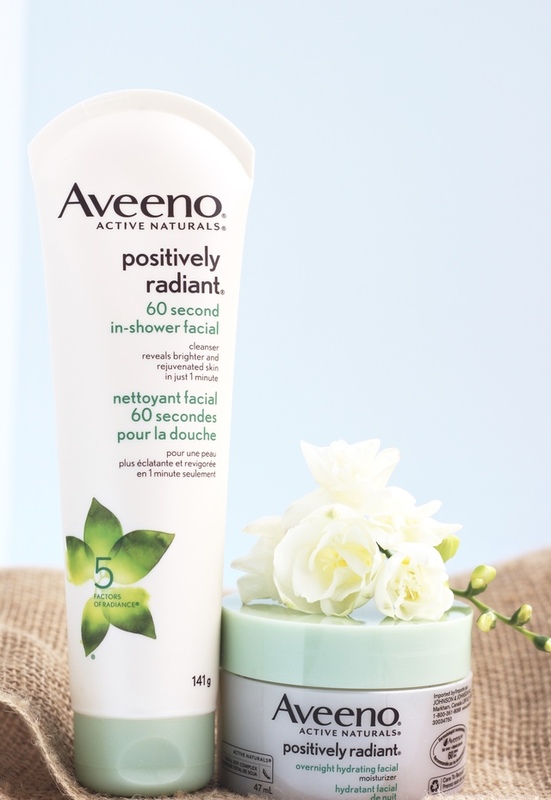 AVEENO’s Positively Radiant 60 Second In-Shower Facial will not only refresh and reinvigorate your skin, but it will, in turn, save you loads of time. Some mornings my face could use a little more care, (when the effects of a late-night are clearly visible), but I don’t have 10+ minutes to do a face mask or facial. I love that this In-Shower Facial has no irritating scent, and you can actually feel the cleanser working together with the steam of the shower to leave you brighter, more radiant and rejuvenated. It deeply but gently exfoliates, cleans, and works hard to get you looking lovely! 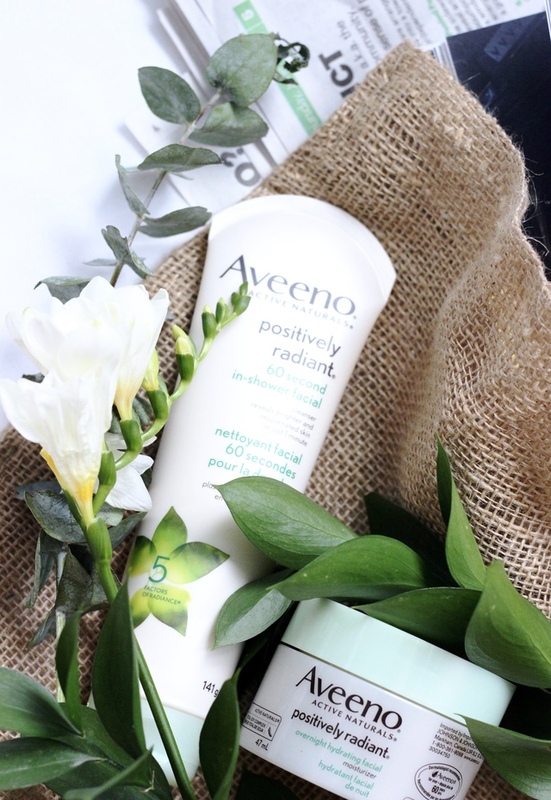 Bonus-- AVEENO also released their new Positively Radiant Overnight Hydrating Facial, which means you can get to working on your facial in the PM before bed as well. It's a luxurious moisturizer that works in the night to get your skin looking soft, revived and nourished. Formulated with Total Soy Complex to fight dullness, redness, spots and imperfections, this moisturizer will save you that "extra step" on the most hectic of nights and days. Do you have any tips for carving out time for yourself in the morning? What do you do?! 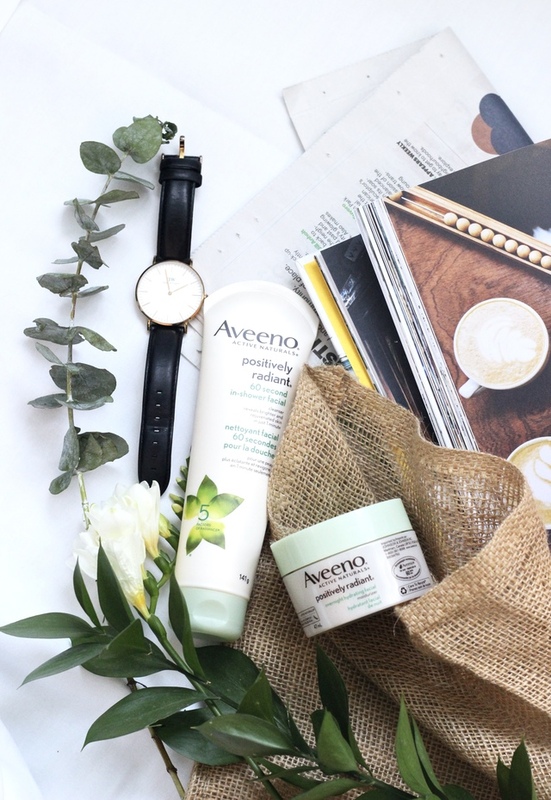 Thank you to AVEENO for generously sponsoring this post. Like always, all thought and opinions are my own and I would not reccommend any products that I wouldn't use on myself.